du Boulay are proud to have recently completed their latest Hawksmoor project in partnership with designers Macaulay Sinclair, the first to open north of the border. 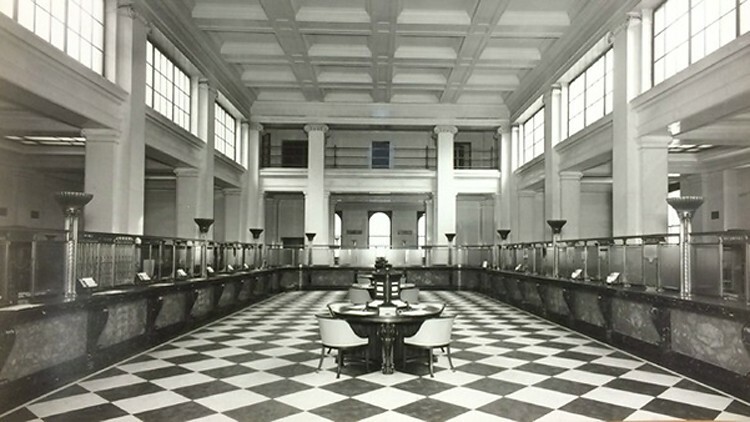 The 185 cover restaurant is housed within a beautiful Grade A listed ‘building of national importance’ which was once the National Bank of Scotland Banking Hall. Built between 1935 and 1942, this rare example of late Art Deco Scottish architecture has been refurbished with great care and sensitivity to celebrate the building’s original features such as the polished limestone-clad interior and etched glass windows. Many reclaimed materials from the same era have been sourced: paneling from a grand Glaswegian townhouse has been used to create the curved bar in the centre of the restaurant, and mahogany radiator covers from the British Museum form part of the kitchen pass. Other additions of interest include lights from a 1920s factory in France, teak parquet flooring from a Blackpool ballroom and iroko science laboratory counters from grand public schools re-purposed as table tops. Hawksmoor is amongst the UK’s best known and most respected restaurants, with a reputation for sustainability, ethical sourcing and being a great company to work for (having been listed as one of the best 100 places to work in the UK in the Sunday Times’ Best Companies list for seven years running). With its simple ethos of sourcing the best possible ingredients and providing great hospitality from people who love what they do, Hawksmoor is set to complement and enhance Edinburgh’s buzzing food and drink scene.